Spruce up your home's curb appeal with wrought iron. 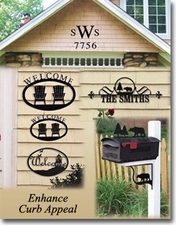 Create your own statement with a custom house plaque, or choose from a variety of available welcome signs. Our black letters and house numbers are great against lighter colored backgrounds. All of these items are finished with a baked-on powder coating for maximum protection from rust to ensure many years of enjoyment.